His name is Aysha, he was from Hungary. He heard about Islam when following the lessons of history in high school, because the country was under Turkish occupation for 150 years. After that Aysha go to university to study molecular biology, where he met many Muslim foreign students. He always wondered why Muslims seem proud that they are Muslims. Aysha was Catholic, devout enough but it always has doubts, and disagrees with some part of his religion, for example: how God can have children and the concept of the Trinity can not be trusted. Then he started talking to her friends, and once when they were having dinner and prayer began to resound, one of his friends asked him to stop, but he refused. He was very impressed with it and something had touched her heart. Then, without realizing that summer he was downloading a program of the Qur'an. He listened to in Arabic as he read an English translation. Then, he thought a lot about Islam and read many books about it. After two months of thinking, he finally chose Islam. He spoke two sentences Creed in front of two friends. Aysha chose to oppose the culture of Islam and his family, especially her mother. After that, Ramadan began and he decided to start his new life in the Islamic Ramadan, and he succeeded. He began to pray on August 4. Initially very difficult because the people around him are not Muslims so that he can not ask anyone. He studied his own manner of prayer the internet, because no one ever showed him how to pray or ablution is done, or what to say prayers before or what the etiquette and rules of Islam. Once, a friend made him feel very sad. "He told me that I will never understand Islam because it is not born as a Muslim," says Aysha. "When I told him that I will begin fasting for Ramadan, he said that it is not just about feeling hungry. At that time I was new to Islam, I recently converted to Islam during one month before he said it. " At that Aysha was afraid. "What if I will never know how to pray in Arabic? What if I do not do it right? And I do not have mukena or mat to perform their prayers, I do not get any help. I have a lot of fear at the time, "he said. "But when I started praying, I think that God must have been smiling on me today. Because I used to always write down the reading prayers in a piece of paper with instructions, and I hold the paper in my right hand and read it aloud. I am sure now that I look funny, "recalls Aysha. But after reading it he managed to memorize prayers in Arabic and is no longer a problem. Then he went up and got a lot of friends and relatives. "From my online brothers get a lot of love and courage." Then a man proposed to her and gave mukena Muslim and Islamic prayer rugs and a book. Aysha get its Arabic-language Al-Quran is the first of Jordan in the mail because she could not buy it in Hungary. Now has more than a year she wore a headscarf. Aysha had a bad period with his mother. The mother keeps telling him that he would become a terrorist and will be leaving his mother as he left his religion. His mother also said that Aysha will leave the country. "He will put all the pork products in the fridge and I will refuse to eat it and then it turns into a fight," says Aysha. Aysha's mother could not bear to see her praying and wearing a headscarf. Aysha was praying in the room. "He did not want to see me when I wear a hijab. He will say that she gave birth to a son Christian not a Muslim veil. " Aysha has a serious problem with his mother, but she was never rude to him. "But thank God, now he was quiet and seemed to accept that I became a Muslim. I am very thankful to God for this. Now I travel wearing a hijab and she did not say anything. " First, Aysha has never spoken to her father and the father did not want to see it. However, because Islam, Aysha opening up to the father and now his father was visiting Aysha and her mother regularly. "Yes, my life is full of great trials, but I thank God for it and I have the patience and hope. On the day of Judgement I will be very grateful to them. So I try to be better and more learning and better understanding of my religion. " "I believe everything is predestined, so God decided whatever will happen to me, I can not change it, but I can choose to live my life well," says Aysha. Now, Aysha trying to help others in Debrecen. He organized a project to collect used clothing for people in refugee camps. There are many Muslims who have no homes due to war. Aysha and her colleagues collect clothes, go to the region and Pakistan make bread for the children and women in refugee camps. "They are very happy and exciting to see them." "I used to convey the opinion if something is bothering me, but now I always try to give examples wherever I go," says Aysha. He also tried to guide those who want or have recently converted to Islam. A few days earlier, Aysha met two Hungarian women who had recently become converts. He also gave them some books, prayer mats and copies of the Qur'an. All three perform prayers in congregation and both look very happy converts. "I try to always leave impression that Muslims are good and friendly." 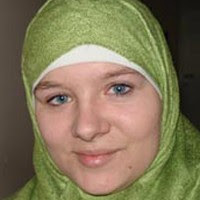 Aysha convert to Islam and a half years ago. Now he is learning Arabic to be able to read the Qur'an. "I read the Qur'an in Hungarian, I pray five times a day, I tried to follow the Qur'an and Sunnah Rasul, and I read lots of books to get a better understanding."